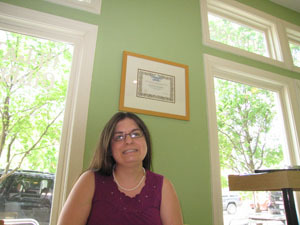 This was supposed to post in May 2011, but blogger went through some issues and this post was removed. I thought I would go ahead and post it now, even though it is almost as seasonally inappropriate as possible. My family and I slept in on Mother's Day. I woke up with Monkey Georgia snuggled up to me. She crawled into our bed sometime in the night, which she does some nights. I wanted to get up, but I enjoyed being in bed too, so I waited. And then I heard a little voice say, "Get up, Daddy! It's Mother's Day!" He said, "Why don't you tell Mommy it's Mother's Day?" and so she did. While I was getting ready (make-up even! ), she came in almost jumping up and down. "I'm just SO ehcited! (excited)" she exclaimed. She and her daddy had been keeping a secret from me for almost a week, and I think she was about to burst. For lunch, they took me to Jasmine Chinese Cuisine, a newish Chinese restaurant relatively near us. (In the English Station/Lake Forest area, for locals.) We had a Groupon for the meal, which we decided to buy after seeing so many unfamiliar dishes on the menu. I chose ginger chicken, which I had never seen on a Chinese menu before (Thai or Vietnamese, yes, but not Chinese). 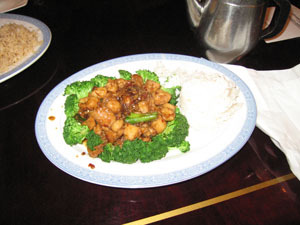 It was served on a bed or broccoli, and a side of steamed rice. I thought it was wonderful. 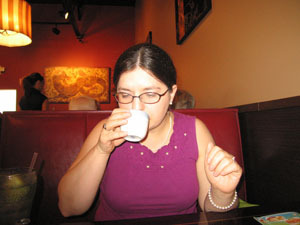 I also got hot tea, which made me feel connected to my Mama and my Grandma (and PawPaw) who used to get hot tea when we went out for Chinese food. We made a quick stop after lunch for me to buy a newspaper. When I got back in the car, Monkey Georgia said, "But how far is the gelato place?" She held out for a long time, but she let the cat out of the bag. I did not mind though. The first time we had gelato at Gilberto Gelato was last year on Mother's Day. I would be happy for gelato to become a yearly Mother's Day tradition! Monkey Georgia had strawberry sorbetto and raspberry chocolate chip. The chocolate chips were bitter dark chocolate and she was not happy. We've made a note not to let her have chocolate chip gelatoes anymore. Uhn Gi chose vanilla gelato and strawberry sorbetto. The vanilla was fragrant and floral. It was made with Madagascar vanilla beans. 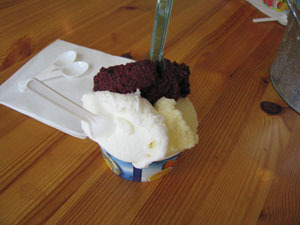 I chose coconut gelato, pineapple sorbetto, and fruitti di Bosco. If I had to do it over, I would have just gotten the fruitti di Bosco. It was strawberry, blueberry and blackberry sorbetto, and was thick and chunky and filled with fruit. The flavor was so intense. Unfortunately, the flavor is only rarely made because of the seasonality of the ingredients. I could eat it all the time. After gelato, we went to Costco which is a few miles away. Every time we go, Monkey Georgia asks if they can buy me flowers and Uhn Gi always say no (our cat eats flowers). So for Mother's Day, Monkey Georgia got to pick out flowers for me. It was difficult to decide which bouquet she wanted to get. 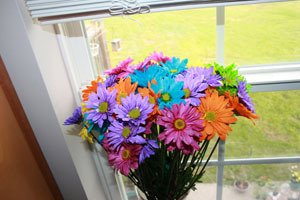 She wanted to get the "rainbow" flowers, but when she saw the "Mother's Day" bouquet, her resolve wavered. (The Mother's Day bouquet included lilies and was in decorated cellophane.) She finally decided to get the rainbow flowers like she had originally planned. 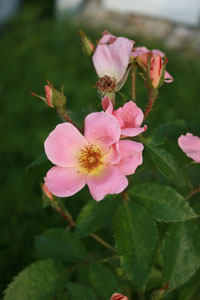 They also bought me a rose bush since my husband wanted to get me roses but prefers not to buy flowers that just wilt a few days later. 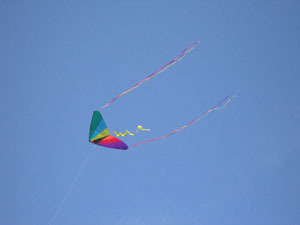 Later in the day, we flew kites and worked in the garden. It was a wonderful day! Review: Who Peed on My Yoga Mat? I just finished Lela Davidson's new book Who Peed on My Yoga Mat? It's a collection of humorous essays about marriage, parenting, and dealing with the other kids' parents. I found myself laughing out loud at several points. Her perspective on some things is quite different than mine, but our children are different ages. I may have a different perspective on how much time kids spend with their parents when my daughter is nearly a teenager too! My favorite essays in the book are about marriage. She has been married for 17 years, which I consider quite an accomplishment. She writes about trying to schedule romantic weekends away, and even romantic evenings at home. Her Google calendar trick is worth trying, even if it did not work for her. Her essay about women's undergarments helped change my mind about a shopping trip I had a few weeks ago. Since I have young relatives who read my blog, that's all I'm going to say about that. The book is due to be released on December 4. (I received an advanced reader copy, but the opinions expressed here are my own.) If you are a mom, especially with kids between 9 and 14, definitely check out this book.